Trump boosts bills to teach his favorite book — the Bible — in public schools David KnowlesEditor,Yahoo News• January 30, 2019 Photo illustration: Yahoo News: photos: AP, ShutterstockPresident Trump signaled his support on Monday for state bills that would allow public schools to teach courses in the Bible, which he once proclaimed was his favorite book. Donald J. Trump@realDonaldTrumpNumerous states introducing Bible Literacy classes, giving students the option of studying the Bible. Starting to make a turn back? Great! 3:21 PM – Jan 28, 2019 Trump’s tweet came minutes after “Fox & Friends” aired a segment Monday morning on pending legislation in six states — Florida, Indiana, Missouri, North Dakota, Virginia and West Virginia — that would allow Bible literacy courses to become a part of a public school education.“Nothing beats the Bible,” Trump famously said on the campaign trail in 2015 — not even “The Art of the Deal.”The Christian activists who crafted the template for inserting the Bible into public school curricula celebrated the president’s endorsement of the idea.“We were excited to see it happen,” Steven Fitschen, president of the National Legal Foundation, told Yahoo News. “The model bill that we were involved with is for the state level, but we were excited to see him use his bully pulpit, so to speak.”Fitschen said the Congressional Prayer Caucus Foundation — a nonprofit group formed by former Virginia Republican Congressman J. Randy Forbes to promote “restoring Judeo-Christian principles” — hired him to help draft the text of legislation that could withstand First Amendment challenges to teaching the Bible in schools.“We looked at what was already in existence and tried to craft a model bill so we could eliminate any constitutional problems, so there could be a course that taught about Islam or Buddhism or any other religion. Many other schools already have comparative religion courses,” Fitschen said. “The reason we centered in on the Bible, the Old Testament and the New Testament, is the history of the country, how much of our idiom and our political framework, all these things that were biblically derived because of the historical situation with many of the early colonists.”The American Civil Liberties Union blasted both the attempt to infuse Bible literacy courses in pubic schools and Trump’s support of it. Its concern is that, notwithstanding Fitschen’s self-proclaimed commitment to religious neutrality, in practice the courses could, at least in some states, amount to a form of Christian evangelism.“Yet again, President Trump is exploiting religious divisions to score political points. Public school Bible courses are rarely taught neutrally and objectively as required by the Constitution,” Daniel Mach, director of the ACLU Program on Freedom of Religion and Belief, told Yahoo News in an email. “Instead, these courses usually resemble Sunday school classes that blatantly violate students’ and parents’ First Amendment rights. Religious education is best left to families and faith communities, not public school officials.”Just as the pro-business American Legislative Exchange Council crafts model bills that can be adapted and introduced in states across the country, the Congressional Prayer Caucus Foundation’s blueprint for inserting the Bible into public schools follows a similar starter-kit approach.“We don’t get involved with the legislative battles,” Fitschen said. “Instead what we do is we put together model bills that we think would work in any of the 50 states, and it’s up on the foundation website.”While bills following the foundation’s template failed to pass in Alabama, Iowa and West Virginia last year, Kentucky passed its version, House Bill 128, in 2017, over objections from the ACLU, and it was signed into law by Republican Gov. Matt Bevin.Supporters of Bible literacy classes say the text is being taught as a historical and cultural document, but the ACLU contends that including it in the curriculum is a way to promote religion.“In several of these classes, teachers are using the Bible to impart religious life lessons and actively inculcate Christianity,” the ACLU of Kentucky wrote in a letter last year to schools seeking clarity on how the text would be presented to students.Bills written by pro-religious groups that seek to influence the public school curriculum are not uncommon in the U.S. A new Florida measure authored by the Florida Citizens Alliance and sponsored in the state’s Legislature by Republican Rep. Dennis Baxley seeks to require public schools to teach alternatives to climate change and evolution.A September poll from the Public Religion Research Institute found Trump’s approval rating from white evangelicals holding firm at 71 percent, and Monday’s tweet probably won’t change that.A course in Biblical literacy might have helped Trump, who once mistakenly referred to one of the New Testament books as “Two Corinthians” instead of “Second Corinthians” — embarrassingly, at a speech at the evangelical Liberty University.On its website, the National Legal Foundation says its mission is to “prayerfully create and implement innovative strategies that, through decisive action, will cause America’s public policy and legal system to support and facilitate God’s purpose for her.”Both the NLF and the CPCF view their goal of seeing Bible literacy taught in schools in all 50 states as a longterm project.“I expect in some the states where it has failed they’ll try again,” Fitschen said. Dylan Stableford Senior Editor,Yahoo News• January 29, 2019 Christie says Trump made things worse for himself by tweeting about Mueller investigation Chris Christie repeatedly told President Trump not to tweet about special counsel Robert Mueller’s Russia investigation, the former New Jersey governor and off-and-on Trump confidant said on TV Tuesday morning. Valentine’s Day 2019 will be in just over two weeks, and there’s no indication the Russia investigation will be over, much less forgotten, by then.Christie, who was reportedly considered for several positions in Trump’s Cabinet, did not mince words when discussing the people who have been giving Trump strategic and legal advice.He characterized Trump’s lawyers as a “C-level legal team.”“What I was trying to tell the president that day was, don’t be fooled by what these lawyers are telling you,” Christie said. “There’s no way you can make this investigation shorter. But there’s lots of ways you can make it longer. And the way you can do that is you can keep talking about it and tweeting about it. Because every time you do that, prosecutors are going to say, ‘Great. More things for us to chase down.’”The president did not heed Christie’s advice.Since Feb. 14, 2017, Trump has tweeted about Mueller, Russia or the special counsel’s investigation — which the president frequently describes as a “witch hunt” — at least 92 times. CAIRO (Reuters) – French President Emmanuel Macron said on Monday that he told his Egyptian counterpart Abdel Fattah al-Sisi during a trip to Cairo that stability and security could not be separated from human rights. 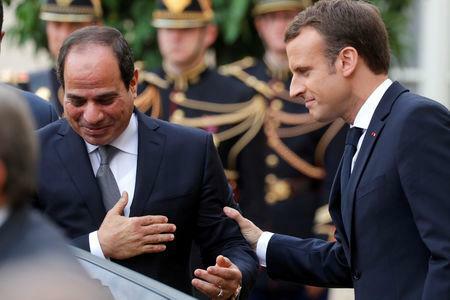 Macron, received with pomp during a three-day state visit, has been under pressure from non-governmental organizations to take a firmer stance after stating in 2017 that he would not lecture Sisi on rights. „Stability and durable peace go together with respect for individual dignity and the rule of law, and the search for stability cannot be dissociated from the question of human rights,” he said during a joint news conference with Sisi that was dominated by the subject of rights. „Things haven’t gone in the right direction since 2017 — bloggers, journalists are in prison and because of that Egypt’s image can find itself suffering,” Macron said. Sisi told reporters that rights should be taken in the context of regional turbulence and the fight against terrorism. „We’re not like Europe, nor the United States, we are a country or a region that has its own characteristics,” he said. Sisi ousted former President Mohamed Mursi of the Muslim Brotherhood in 2013 and was elected as president a year later, presiding over a crackdown on opposition that has extended from Islamists to liberal activists. Sisi and his supporters say the measures are needed to stabilize Egypt after the turmoil that followed the country’s 2011 uprising. In an interview this month Sisi denied Egypt was holding political prisoners, though one rights group estimates the number at 60,000. French officials say Egypt is a key strategic partner for promoting stability and security in the region, including in Libya, which Macron has put at the top of his foreign policy agenda. Eight human rights groups had urged Macron to deliver a strong message on rights during his trip, free „unjustly detained” prisoners and suspend arms sales that could be used in rights violations. The France director for Human Rights Watch, one of the groups, cautiously welcomed Macron’s comments on Monday. „It’s an important recognition by Macron of the centrality of human rights in the struggle against terrorism,” said Benedicte Jeannerod. During Macron’s trip officials signed 40 trade deals and development agreements worth an estimated total of 1.6 billion euros, covering sectors including transport, energy, health and telecoms, Egypt’s investment ministry said in a statement. 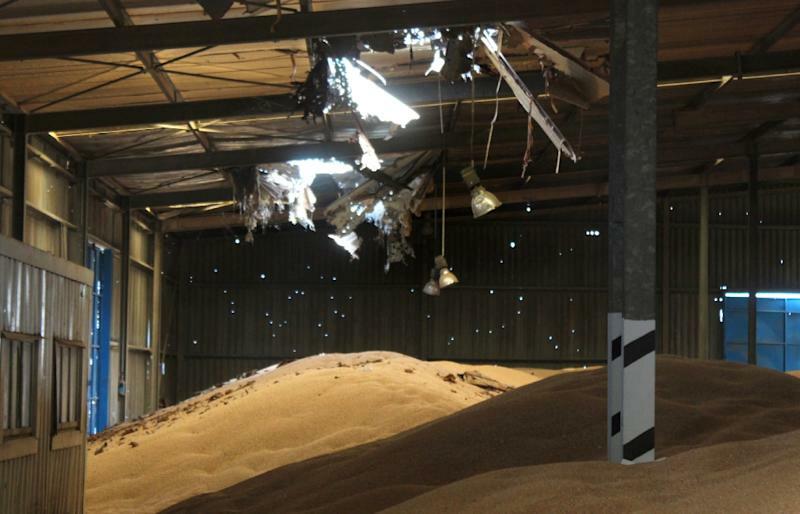 Hodeida (Yemen) (AFP) – Gunshots reverberate through a battle-scarred granary in the port city of Hodeida, where a mountain of grain meant for starving Yemenis remains inaccessible as a hard-won ceasefire comes under strain. The Red Sea Mills, one of the last positions seized by Saudi and Emirati-backed forces before last month’s UN-brokered truce, holds wheat that could feed nearly four million people for a month in a country on the brink of famine. 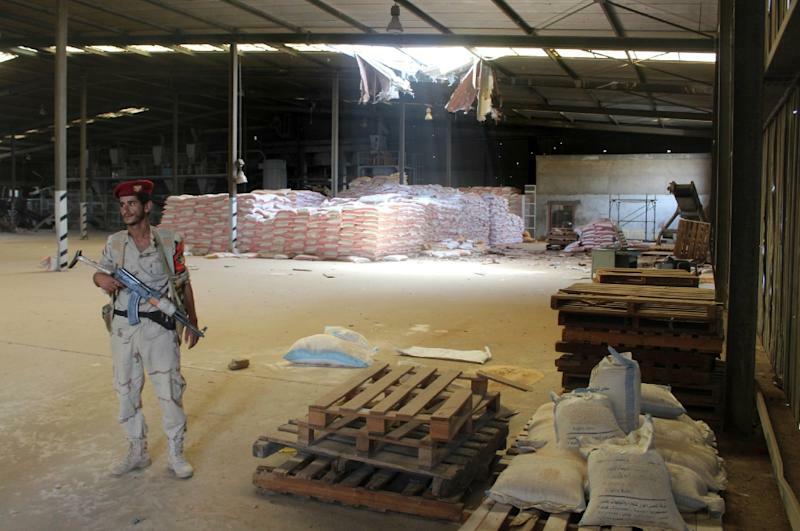 But the facility, a shrapnel-pocked symbol of how controlling food is a weapon in Yemen’s war, has remained off-limits to aid organisations since September as skirmishes shake the fragile ceasefire agreed with Huthi rebels during talks in Sweden. The site, on Hodeida’s eastern edges, was rigged heavily with mines when it slipped from Huthi control in November. Last week, during a military embed organised by the Saudi-led coalition, AFP saw government loyalists including Sudanese soldiers scouring the vast complex with metal detectors amid fears rebels were sneaking in to plant new booby traps. Sudan is a member of the Saudi-led coalition. A column of smoke snaked into the sky from Huthi positions less than a mile (1.6 kilometres) away, with loyalists saying the rebels were burning tyres in a provocative move. Then, a volley of close-range gunshots crackled through the complex. It was not possible to tell who was firing. „We are committed to the truce… but the enemy has not committed to anything as you can see and hear,” said Yemeni commander Mohammed Salman, standing by a pile of grain. Just after the tour, the UN on Friday reported apparent mortar shelling at the mill had started a fire that left two food silos damaged. „The loss of this wheat comes at a terrible time,” said the UN’s humanitarian coordinator Lise Grande. In Hodeida, the entry point for more than two-thirds of Yemen’s food imports and international aid, the choices are stark — either an imperfect truce with violations on both sides or all-out fighting that could unleash famine. The ceasefire came after Western nations pressed Saudi Arabia to end its four-year military campaign in Yemen after journalist Jamal Khashoggi’s murder intensified international scrutiny. But with recurring breaches, observers warn that its collapse could be just a matter of time. „If it is allowed to break down, there will be no opportunity for a similar deal for a long time,” the International Crisis Group said. Inside Hodeida, a city rippling with tension as the war-wounded continue to trickle into hospitals, a common refrain among civilians and military officials is „mafi hudna” —- Arabic for „no truce”. 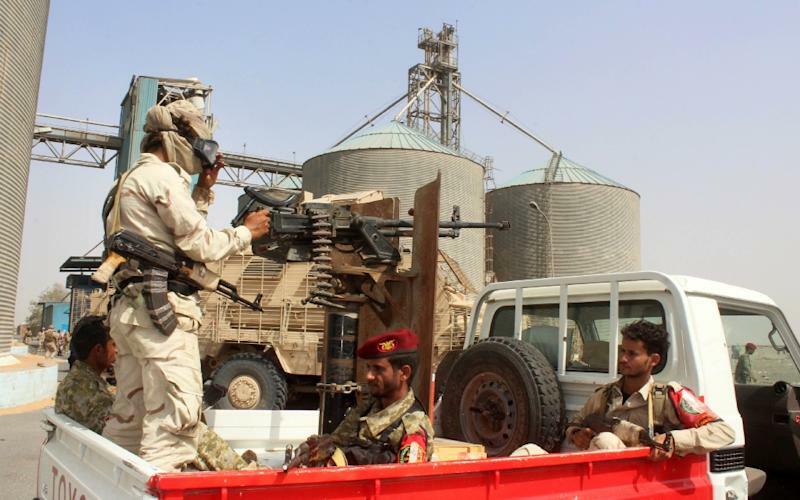 Colonel Saeed Salmeen, an Emirati commander on Yemen’s west coast, told AFP his men were committed to the ceasefire but were „always ready” for battle. He warned that Yemen’s west coast road -— a key supply route linking the south to Hodeida —- was a „red line”. UN chief Antonio Guterres said on January 7 that neither side had tried to gain new territory since the ceasefire. But an agreed redeployment of rival forces from the city, a key confidence-building measure, has not happened as distrust runs high. Guterres pointed to allegations from the Huthis that pro-government forces are massing troops near the city, and from the Saudi-led coalition that the rebels are fortifying positions with barricades and trenches. „How long can the international community accept this Huthi game — ceasefire, regroup, ceasefire, regroup?” a member of the coalition told AFP, requesting anonymity. The sentiment was echoed by other pro-government troops who insisted to AFP that military action was the only solution even if it results in bloodshed. But the truce has given the World Food Programme „some breathing room” to reach districts in southern Hodeida that were previously inaccessible due to fighting, its country director Stephen Anderson told AFP. However, 51,000 metric tonnes of wheat — one quarter of WFP’s flour-milling capacity in Yemen — remains locked away in the Red Sea Mills. „We have been trying to get access… (But I hear) the Huthis aren’t allowing us to get to the mill,” WFP chief David Beasley said in an interview in Davos. The lack of access to the mill, one of the most hotly contested sites in Hodeida, is a collective punishment for starving Yemenis on both sides of the conflict. Salman, the Yemeni commander, alleged the Huthis hoarded grain, creating artificial shortages and exacerbating famine-like conditions. When the Huthis controlled the mill, they accused the coalition of destroying food with indiscriminate air strikes. „The Red Sea Mills is a leverage point being used in the most Machiavellian ways by all warring parties to achieve political goals,” said Wesam Qaid, executive director of Yemeni development organisation SMEPS. ISTANBUL/GENEVA (Reuters) – The U.N. human rights investigator leading the international inquiry into the murder of Saudi journalist Jamal Khashoggi will meet Istanbul’s chief prosecutor on Tuesday, the prosecutor’s office said. 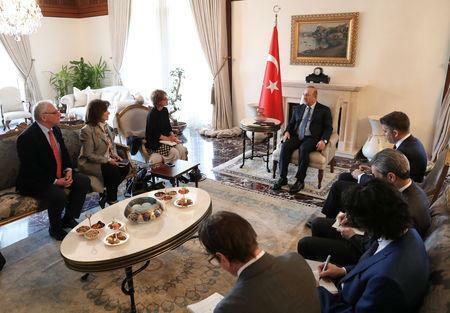 Special Rapporteur Agnes Callamard, on a week-long visit to Turkey with a forensic and legal team, met Foreign Minister Mevlut Cavusoglu on Monday. Khashoggi, a Washington Post columnist, was murdered inside the Saudi consulate in Istanbul on Oct. 2. U.S. intelligence agencies believe the de facto Saudi ruler Crown Prince Mohammed bin Salman ordered an operation to kill Khashoggi, whose body was dismembered. Riyadh denies that the prince had any involvement. Saudi officials have not replied to Reuters queries on whether they will accept Callamard’s request to meet the Saudi Ambassador in Turkey and to visit the kingdom as part of her investigation. Kenneth Roth, executive director of Human Rights Watch, said that the panel’s investigation would focus on establishing responsibility. He called for the Central Intelligence Agency (CIA) to share its intercepted recordings of the crime. Roth told reporters at an event in Geneva that Callamard was trying to look at the question of authorization. „There is no question that this was a Saudi government operation, but the government’s line is that this was a rogue operation by people somehow who didn’t have anything to do with the Saudi Crown Prince, even though a number of his close aides were intimately involved, and there was a well-reported call back to Riyadh to tell the boss that the deed was done,” he said. „So what the special rapporteur is going to look at is what evidence is there to pinpoint the Saudi Crown Prince’s responsibility,” he said. Roth, who said he had spoken to Callamard last week, added: „The CIA has come out, apparently on the basis of intercepts, and said that the Crown Prince did order this murder. And the U.S. Senate endorsed that finding. „I hope that the CIA will share those intercepts and that evidence with the special rapporteur. „I think this is an important enough issue that it is time in some form to release them so that we can all see it. I know that the special rapporteur is pushing for that,” Roth said. The gruesome murder has drawn attention to the Saudi government’s detention and alleged mistreatment of Saudi activists, including women, and the bombing campaign by the Saudi-led coalition in Yemen, he said. „It is unfortunate it has taken the Khashoggi murder to galvanize people, but it did and that somehow woke people up to the nature of the Saudi government,” he said. Gaza City (Palestinian Territories) (AFP) – The sole passenger crossing between Gaza and Egypt will reopen in both directions Tuesday, the strip’s Islamist rulers Hamas said, after it was partially closed amid Palestinian political infighting. 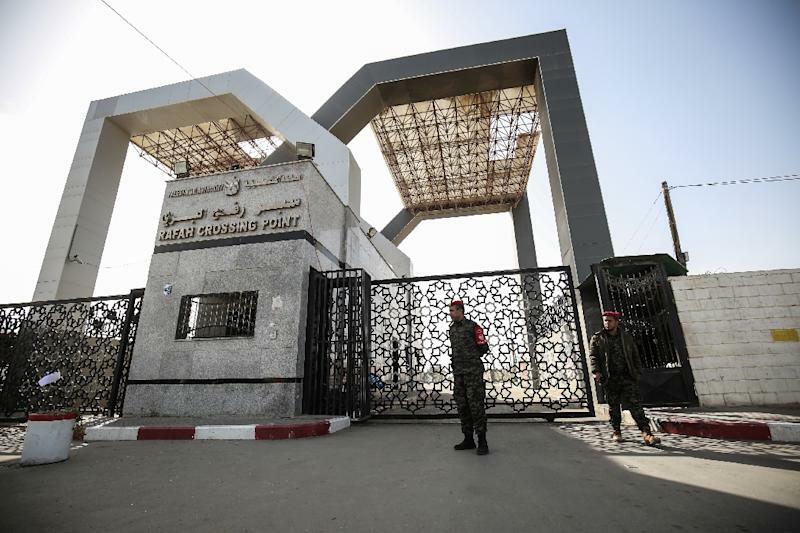 In a statement late Monday, the Hamas-run interior ministry announced „the opening of the Rafah border crossing in both directions on Tuesday”. There was no immediate confirmation from Egypt. Forces loyal to Palestinian Authority president Mahmud Abbas withdrew on January 6 from the Rafah border crossing, accusing rivals Hamas of interference. Hamas employees retook the post and negotiated with Egypt, saying they were seeking to maintain control after the PA’s withdrawal. Since then Egypt had kept the border sealed for those seeking to leave the Gaza Strip, while allowing those returning to enter. The crossing is the only way for Palestinians to leave Gaza that bypasses Israel and is a key lifeline for the enclave’s two million residents. Hamas has controlled Gaza since seizing it from Abbas’s forces in a 2007 near civil war. The PA had retaken control of the border after a 2017 reconciliation deal between Abbas’s Fatah, which dominates the PA, and Hamas. That deal has since collapsed and relations between the parties have worsened.